ISBN 9780786697946. 8.75 x 11.75 inches. 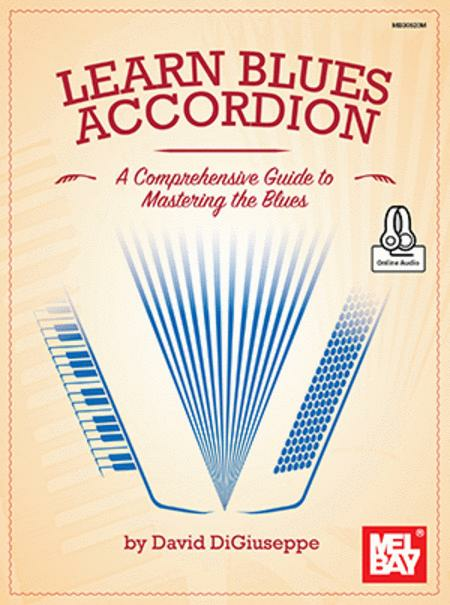 Learn Blues Accordion is a unique method book that includes 34 blues compositions and numerous exercises that will help you master the blues. The exercises increase in difficulty and introduce concepts and techniques that specifically target both hands. Explore blues scales, chord progressions and learn common blues techniques such as grace notes, slides, pedal points, double stops and tremolos. Left hand accompanying rhythmic styles are taught and used throughout the material, including boogie-woogie, the blues shuffle, New Orleans and walking bass lines. This book also features exercises on comping chords in common blues keys using various rhythmic patterns. Accompanying audio is recorded in stereo format, separating the left and right hands. The recordings are available online with included access.